German engraver and mapmaker of Augsburg. 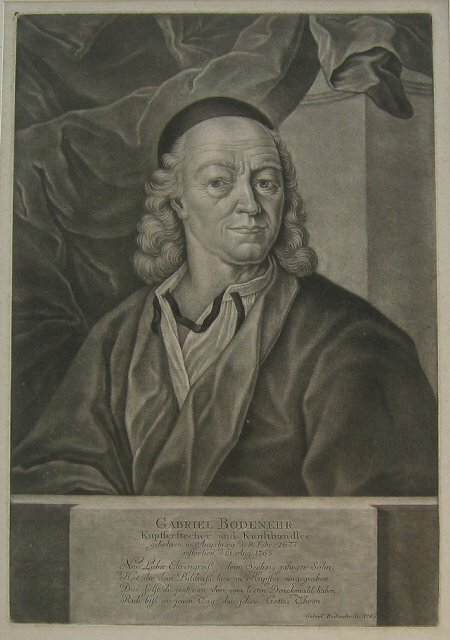 Son of Johann Georg Bodenehr [1631-1704] & from a family dynasty of engravers and publishers. His works include Atlas Curieux  and Curioser Staats und Kriegs Theatrum . In 1717 the family took over the Augsburg publishing house of Stridbeck. Succeeded by his son Gabriel the younger. The dates ascribed to both Gabriel Bodenehrs in Tooley's Dictionary of Mapmakers appear erroneous.